Vintage lucite Italian teardrop beads, faux light aventurine, teardrop beads, beads, teardrops, jewelry making, vintage supplies, B'sue Boutiques. Top-drilled. 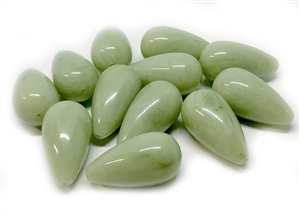 Beautiful faux light aventurine, just yummy! Teardrop shape beads. Measuring from 26 x 14mm. Twelve (12) piece lot. Sold by lot.